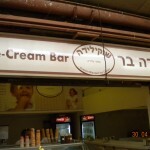 CHOCOLIDA – SHUK – MACHANE YEHUDA – There is a new ice cream/frozen yogurt store in the shuk on Eitz Chaim (closed) Street. While the worker/owner sports a kippa, the store does not have a kashrut certificate from any agency. Interestingly, when I was living in N. America some 25 years ago, if we would see a store without a kashrut certification we simply said “It’s not kosher and we cannot eat here”. For some strange reason, there are observant Jews who feel this simple rule does not apply here, in Israel. One must see a kashrut certificate from a reliable agency before making a decision that a store is kosher – it is really that simple. Perhaps enter and ask what hechsher he has. If enough people leave, or politely recommend that he get a hechsher, he may get the message. Posted on May 3, 2010 by JKN Israel. This entry was posted in JKN Alerts. Bookmark the permalink. Speaking strictly for myself, I think there are two reasons why: 1) We feel a closer connection with our fellow Yiddin here, and 2) We have a greater distrust of the Rabbinical authorities. I personally used to buy sandwiches from one small sandwich shop (long since closed) downtown. The owner, a little old man, lived in my neighborhood, I davened with him in the local shtiebelach, and otherwise felt a personal connection with him. He told me that he quite simply could not afford it. He quoted some absurd figure that was asked for te`udah because he did “cooking” on premises – he would make a pan of shakshuka on a hot plate every morning – I personally watched him checking the eggs one morning. Because of this, his te`udah would cost some four digit number – I misremember the details after two decades – and he said that was quite frankly the difference between him supporting himself and his wife in their “retirement” or not. All of his cold cuts were kept clearly in their manufacturer’s package until put on the sandwiches, and I saw him once checking his lettuce (before Gush Katif produce became popular.) He was yiras shamayim and shomer kashrus l’mehadrin, and he didn’t have a heksher, saying that people could either know him and trust him or not. I trusted him, and I don’t think the situation would have changed if someone with a connection to some organized body were to come in once every month or every three months, plus the occasional surprise visit. What could they surprise with a little old man in a ten meter space, a refrigerator for produce and one for soda, a hotplate on the edge of his butcher block counter, and a little sink? (He used to have to roll the drinks refrigerator aside to let you behind the counter to vass – many people got take-away.) The place was as kosher as could be, heksher or no. So there you have it. The most important thing IMHO is that the staff is yiras shamayim or has hashgacha tsmuda – fear of the Rabbinate just won’t keep people honest. 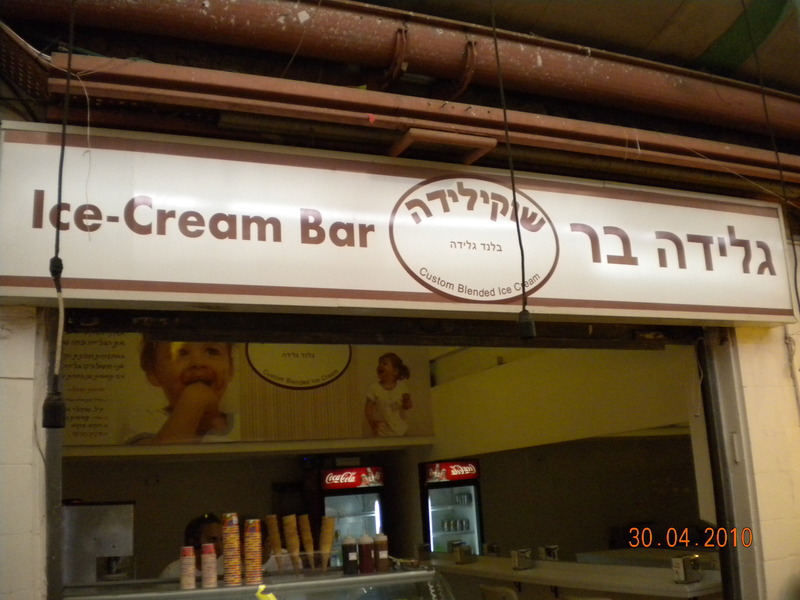 I was there yesterday the man told me the the ice cream is strause with rav landau’s i bought a bar of yogert he put in a michine to soften it. I’m sure that your friendly sandwich man was strict with Kashrus, and this might work in a quiet neighbourhood, but a shop in the busy shuk, where people dont know each other, should have reliable documentation that it is kosher, and not rely on potentially misplaced trust or heresay. Near where I work there is a shop with signs on the outside saying בשר – the owner, who wears a kippa at work, added a dot of paint to change the chaf to a bet. Dig just a little deeper, and he’ll tell of leagl rows with the rabbanut. this doesn’t fill you with confidence that the place is kosher. When I was in yeshiva, the yeshiva bought our main meals from a place in the Beis Yisroel area that did not sport a teudat kashrut. The ba’al h’chanut was well know to be trustworthy. Just as frum people would eat in his home, they would purchase from his shop. The point of hashgacha is to give a reliable basis to make a decision whether to eat in a place. The teuda does not make the food kosher; the lack of teuda does not make it treif. The point I was trying to make is that I don’t believe that even surprise inspections help. I imagine that if the mashgiach had come in suddenly and found the package of cheese in that treif pundak in the Haifa CBS, the owner would have apologized, said it was a mistake, and it would have gone into the garbage… and the owner might or might not have run out the same day to get a new package of cheese, or else waited until the next day, or hid it better the next time. A man with a kippa who will make and sell cheeseburgers to his fellow Jew will ALWAYS find a way to get around random inspections. He’s yiras NOTHING but making money, and probably gets a thrill out of violating kashrus. So what can we do? Could we ask for a different KIND of te`udah – one where the inspectors “check the workers’ tzitzith?” (And where they never leave food in the presence of our “cousins” – I’ve seen on a construction site where Arabs thought it funny to disgust Jewish co-workers by dipping sliced meat in containers of leben – what do the cousins giggle about behind our backs in the shuk?) Can we insist on places with hashgacha tz’mudah? So what’s a Torah Jew supposed to do? Ultimately, when we have to make Din v’Heshbon before the Most High we will be judged I think for how hard we tried, and trust to Divine Rachmanus because even when we insist on a solid te`udah it doesn’t guarantee a thing. JKN is full of reports of places that HAD proper certification and lost it for violations – how can a yiras shamayim yiddel feel, knowing that his insistence on paying more money for a fancy heksher means that he was buying unclean Arab produce and letting some sleazy food importer call him freyer to his back? Only the Kadosh Boruch Hu can tell him what to do now, when there’s no korban asham to bring for a questionable sin or not.